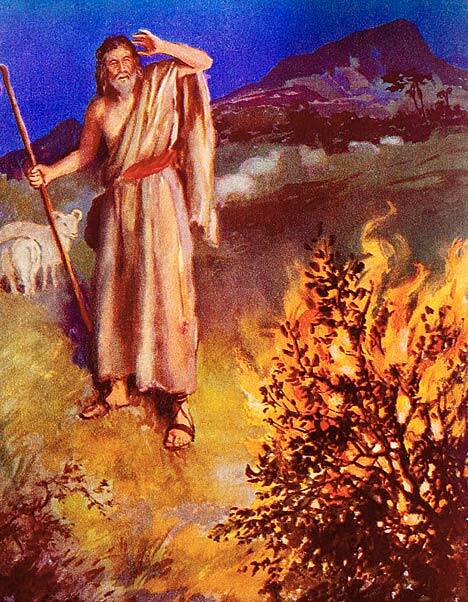 In his heart of hearts, a BBQ Jew believes that Moses led his people through the desert precisely to enjoy chopped pork. And that the Promised Land is not flowing with milk and honey, but barbecue and hush puppies. This site is the brain(step)child of two Jews who do “dig on swine,” thank you very much Jules Winnfield. Porky LeSwine is a North Carolinian born and bred. He grew up in the hinterlands of Unincorporated Orange County. Porky’s parents hail from New York yet he disparagingly refers to all Northern transplants (and vegetarians) as Yankees. He’s been eating BBQ for 20+ years with only minimal damage to his arteries, and is blessed to have a job that takes him to the heart of Eastern and Lexington-style territory. The Rib Rabbi is a Northern transplant, but dislikes that phrase because it evokes bad hair surgery. He shuns the term Yankee, too, as a native Bostonian. North Carolina’s life-affirming barbecue, what The Rib Rabbi once called “pulled pork,” played no small part in luring him south to North Carolina. Five years later, you *might could* find this Rabbi “blessing” BBQ plates in and around Durham, N.C.
Q: When you say BBQ, what do you mean? A: Living in North Carolina and being strict constructionists, we believe that barbecue is a noun. More specifically, it means pork cooked slow and low over wood coals (but, alas, many of even the most famous barbecue joints have switched to gas or electric cooking). Q: Just what is a BBQ Jew? A: A person of Jewish descent who partakes of the pork barbecue. Q: Who are these BBQ Jews? A: Two 30-somethings who believe juicy pork barbecue and Judaism can coexist. That’s what the Day of Atonement is for, right? Q: Why should we trust your barbecue reviews? Q: No seriously, what’s the deal? A: Neither of us keep kosher. 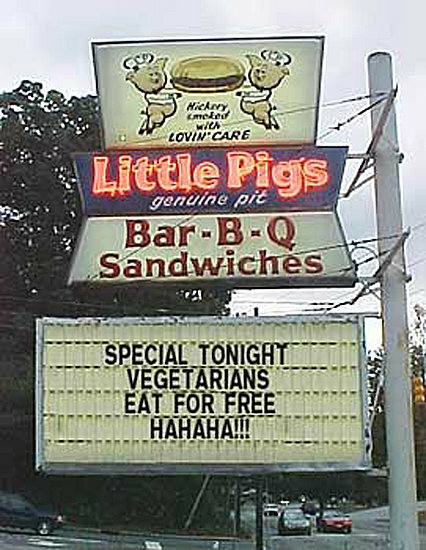 But…we believe that if the fellas who wrote the dietary restrictions lived in North Carolina, they’d not only allow Jews to eat swine, but command it! Q: So you guys prefer to spell it with a ‘c’ rather than a ‘q’? A: As long as you’re paying, we’re flexible. Q: Do you prefer Eastern or Lexington style? Q: Do you think bbqjew.com is a blog or a website? A: We think bbqjew.com combines the self-importance of having our own website with the self-absorption of having our own blog (or maybe it’s the other way around). Shalom and L’Chaim! What would be the blessing over the pork? Hmm, a good question. I may have to seek some Rabbinical advice to answer that one. The key here is substituting “traif” (i.e. unkosher) for “lechem” (bread). Then again, as the great Rabbi Hillel advised, you could conveniently ignore the swine element and say the traditional blessing over the bread while holding a hushpuppy. The choice is yours. Good to know the next I’m out with Jewish friends and we decide to hit up our favorite Q-topolis. Just to note, I too am in the Durham/CH area. I’ve only had Allen and Son’s via catering (i.e. we bring the cooker and pig to you) but it was good nonetheless. I miss an actual pickin’ though. I just found this site and am in love with it at first glance. I grew up in that great “jewdom” known as the 5 towns on Long Island. BBQ was something unknown back then…have since re-located to the Albany, NY area where thank god…ha’shem..we have a couple of decent places (even my NC born non-jewish husband agrees). I have even given a go at making pulled pork myself…on my weber charcoal…and smoked/grilled many a rack of ribs…yes…those ancestors that were rabbis or kosher would shudder…but that’s because they never knew what they were missing. My cousin is in Albany, land of the Egg performance center, you’ll have to tell me what the bbq places are so I know where to eat when I’m up for his wedding. Heard the joint on Hwy 55 in Durham is suppose to be good (used to be AW or A&W’s). That is the one. Thankfully a Q-Shack opened a new location so the poor folks in downtown Chapel Hill and Carrboro can get a decent fix without going too far. Just found your blog and I love to find someone who’s moved to NC and fallen in love with our BBQ. I have to recommend Cape Fear BBQ in Fayetteville, I knew it before Obama stopped there but I was totally impressed that he hit the best local BBQ in F-ville. I used to eat there once a week when I worked downtown. If you get there early enough in the morning Biscuit Kitchen is down the street, on a non-BBQ note. But you can’t go wrong with either place to eat. An inquiry. I live in Los Angeles, am passionate about North Carolina bbq (from the brief time I lived there), and would like to have the name of the best spot that mail orders (knowing that shipping invariably affects quality). I want to cheer up a good friend–a North Carolinian—who’s been ill. Recommendations? I know King’s BBQ in Kinston mail orders. Back in the day they had sent some to David Letterman. I wouldn’t call it the best in East NC though, but it isn’t bad. Kit, sorry your friend is ill, good idea for cheering him/her up! I have heard stories of other restaurants doing special requests like this, but you’d just have to call your favorite place and ask (and make sure they pack the stuff in a cooler with plenty of dry ice or whatever). Let us know what you get! http://www.smokeysshack.com/ – I don’t see a review for Smokey’s…it is technically outside of RTP, but close enough. Not as “down home” as the much beloved Davis BBQ, now closed. I’m a native North Carolinian, who grew up on Stamey’s, now transplanted to Denver. I make the best kosher Carolina-style barbecue west of…well, anywhere. I smoke and sauce beef in true Carolina style, and while not as soft and fabulously textured as pork, it’ll have to do for me and all my kosher-keeping friends. When I put it on a soft white bun, top it with some fine Carolina coleslaw, and serve it with some oniony-sweet hushpuppies (yep, we go whole hog!) I almost think I’m home. Porky, and the Rib Rabbi. I think this will soon turn into my new favorite site. Blogging about it right now! Hi, for Search engine optimisation solid contents are genuinely necessary, if you simply make a copy and paste then you can not ranked in search engines. We just moved to Hendersonville NC from Albany NY, and until I came upon this site I thought I was the only BBQ crazy Jew in North Carolina. Oy, I’m not unique! Now all we have to do is adjust with our South Carolina Q mentality to North Carolina Q. Is this possible? Can we give up the mustard? No disrespect but as a Christian I am not allowed to eat pork or any unclean meat as in Jewish Law I also try to keep Jewish Laws, for All True Christians are Christ Following Jews. For All Christians came from The Jewish Faith and Proclaim Christ as The Messiah. Jesus said 15 If ye love me, keep my commandments. I can not drink strong drink nor smoke or anything that might harm my body. I’m just thinking how can a follower of The Creator eat unclean food? P.S I’m opening a Kosher BBQ Restaurant in Round Rock Texas.